The huge State of California is known for its diverse wine tourism offering north and south of San Francisco. Louise Hurren looks back at experiences of a weekend’s wine tour last summer when she headed to Mendocino, a few hours north of the city. Louise is a wine communicator who lives in southern France. She spends much of her time in the Languedoc vineyards, working with winegrowers to help them raise their profile. Finding ourselves in San Francisco in August with a rental car and time to kill, my partner and I decided to hit the wine trail. We’d visited Sonoma and Napa before, so this time we resolved to go off the beaten track. We weren’t keen to drive too far or spend crazy money, either. A wine-savvy friend had recommended Mendocino County’s Anderson Valley area, so we motored out of town across the Golden Gate bridge and onto Highway 101, heading north. It took us just under four hours to drive up the Pacific coast to the town of Mendocino itself (or Mendo, as the locals call it). Right by the sea – think crashing waves, flocks of pelicans, dramatic cloud formations and eye-popping sunsets – the town is quite lovely, but I wasn’t prepared for the cooler, foggy weather; it pays to pack a decent jacket and perhaps a sweater, even in the height of summer. 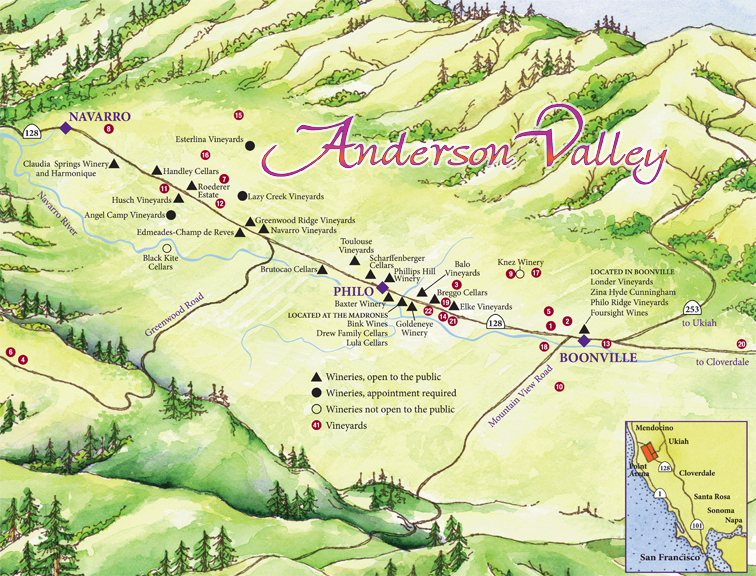 With a population of just under 900 (obviously numbers swell in the summer) and a decidedly green, tree-hugging feel, the town of Mendocino is a friendly place and ideal for wine buffs in search of a starting point from which to explore the Anderson Valley and its vinous delights. We quickly discovered the only wine shop – imaginatively called The Wine Shop – located on Main Street, where owner Mark poured and chatted with enthusiasm. We settled in at the Sweetwater Spa and Inn (I loved our charming room in a former water tower almost as much as the adjoining, hippy-style hot tub spa area that we were allowed to use free of charge), before heading out for dinner. Right next door to our lodgings, the upmarket Café Beaujolais wasn’t cheap but the food was well-prepared, the service was attentive, and they had a surprisingly good selection of wines from around the world, by the glass, from as little as $9, going up to $30. The next morning we set off to explore the Anderson Valley. A leisurely drive east along tree-lined Route 128 took us through a series of shady twists and turns, but once out of the mighty Redwoods, vineyards stretched left and right against a backdrop of rolling, sun-scorched hills. 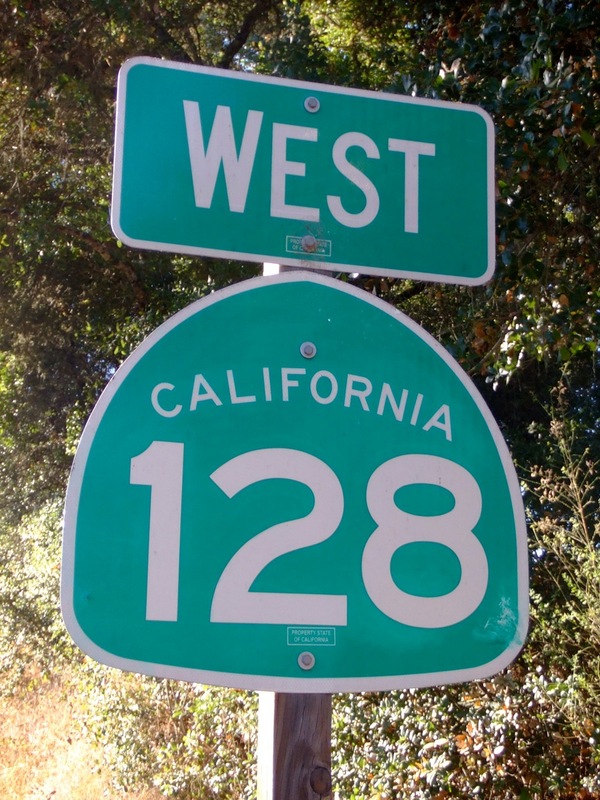 Compared to the Napa Valley and its many upscale, designer-furnished tasting rooms, the homely towns and 20-odd lower-key wineries dotted along this road were a welcome contrast. 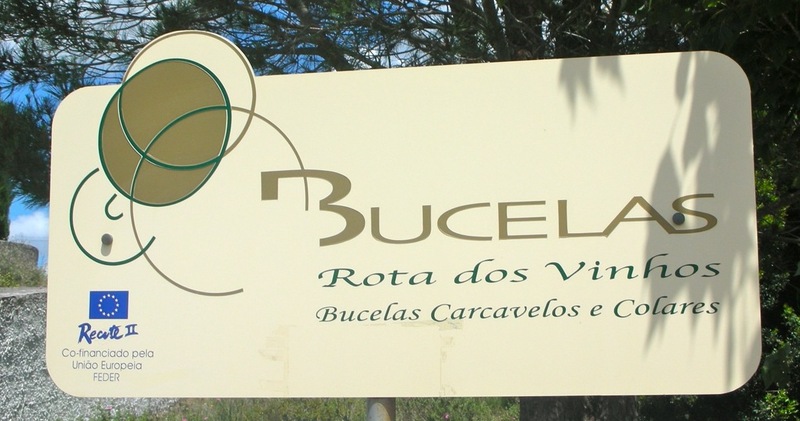 Over our two-day trip we pulled over at a variety of names (Handley Cellars, Navarro, Brutocao, Bink, Drew, Lula) and were rarely disappointed. Smiley, knowledgeable staff offered tastings for free (a welcome change as many Cali wineries charge), and picnicking in the grounds with a glass of wine was actively encouraged. Buying freshly-made sandwiches at roadside delis kept costs down and meant more to spend on special bottles and souvenirs. All the wineries visited sold a multitude of items, from chocolate to condiments, corkscrews to cook books. 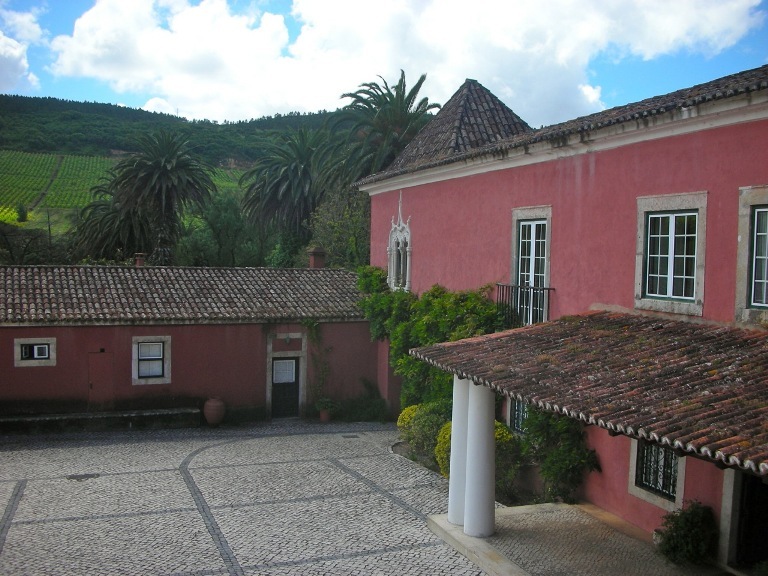 The wines ranged from the heavily-oaked, fruitier, rounder style typical of California to a more restrained, elegant, Old World profile, with those tasted at Brutocao Cellars in Philo a case in point. The winery’s penchant for Italian grape varieties reflects their heritage, and their Zinfandel Port (yes, that’s what it’s called) and Coro Mendocino wines are not to be missed. 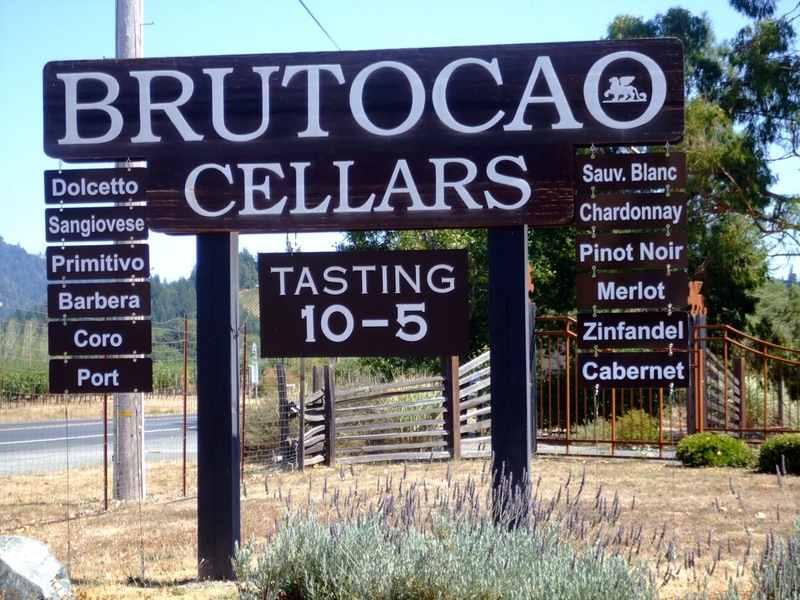 Brutocao is one of a dozen producers who make these special Coro Mendocino wines, a designation for premium wines from a Mendo-grown blend of grapes, predominantly Zinfandel with other, mainly Mediterranean varieties. Just after the town of Philo we stopped at The Madrones, a collection of smart tasting rooms and the Sun & Cricket home wares boutique, complete with tasty cheese counter, and chic rooms to rent, set around peaceful gardens. Kicking back on the grass with chilled glasses of Bink’s Sauvignon Blanc, we stretched our legs before heading on to our next overnight stop at Boonville, at Anderson Valley’s easterly end. Impressed by a funky-looking website, we checked into the retro-chic Boonville Hotel for a night’s pampering and were warmly welcomed. A complimentary glass of local sparkling wine and a plate of oysters hit the spot before we explored the charmingly over-grown gardens, where towering tomato plants, sunflowers and nasturtiums created a riot of colour amongst the rough-hewn wooden furniture. Boonville (population 1,370) has a number of strong points. Firstly, there’s the shopping. There’s only so much wine you can taste in a day, so when a break was needed, we indulged in retail therapy. At the Farmhouse Mercantile store I picked up a gorgeous, leather-bound note book perfect for jotting down my tasting notes; some hand-sewn place mats, and was sorely tempted by some of the retro-style jewellery (I passed on the goats’ milk paint and Earth Mother calico smocks). Neighbouring boutiques on the town’s Main Street, actually Highway 128, sell unique, bourgeois-bohemian home wares and the coffee shops are a delight. We indulged in a gourmet break at La Paysanne coffee shop – their homemade cardamom ice cream is outstanding. Then there’s the plethora of nearby tasting rooms. 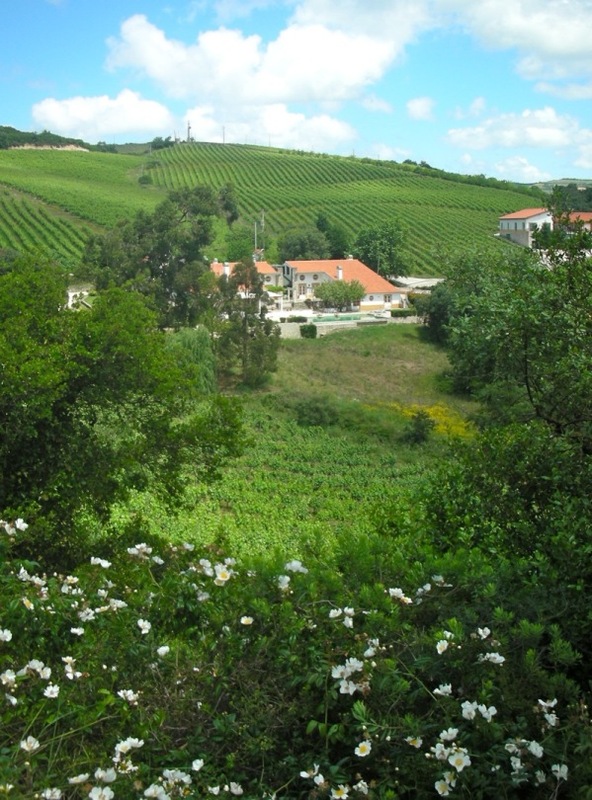 We walked along Boonville’s main drag and sampled wines at Zina Hyde Cunningham, Londer, Philo Ridge and Foursight Wines, before strolling merrily back to dine at our hotel’s Table 128 restaurant; after a long day’s spitting, it was a pleasure to swallow. Finally, from Boonville it’s only 17 miles to Ukiah (turn left a quarter of a mile out of town onto the 253 Country Road) home to the biodynamically-farmed vineyards of Paul Dolan, but that visit must be the subject of another blog post. From Ukiah we motored leisurely south, down through Sonoma and the Napa Valley, and back to our San Francisco starting point, suitably refreshed by the authentic, thoughtfully-crafted wines we’d had the pleasure of discovering.